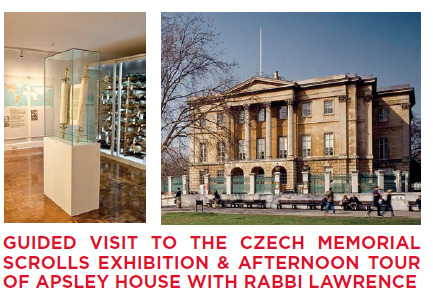 Join Rabbi Lawrence on Wednesday 15th May. The Story of the rescue of 1,564 Czech Scrolls by Westminster Synagogue, which arrived at Kent House in February 1964, has passed into history as a small but remarkable episode in the tragedy of European Jewry. The permanent exhibition which was established in 1988, tells the unique story of the arrival from Prague and of their restoration and distribution to communities throughout the world. Apsley House, a Grade I listed building is the London townhouse of the Duke of Wellington. The house is now run by English Heritage and is open as a museum and art gallery, exhibiting the Wellington Collection, a large collection of paintings, other artworks and memorabilia of the career of the 1st Duke. Discover through the guided tour, stunning art collections, medals and memorabilia and learn about many aspects of the Dukes life and work. Transportation is not provided, more details will follow upon booking.